Eczema can be a difficult condition to manage, especially if your little delicate baby has it. As a parent to a kid that has this condition, you have to be very careful in selecting the right products that won't cause the eczema to flare up. Although most skin care products formulated for babies are mild, one particular product is especially notorious to cause flare ups. I am, of course, talking about sunscreens. According to most pediatricians, it is important to protect your baby’s delicate skin from the ionizing UVA and UVB radiations from the sun. But if your baby has eczema, any run of the mill sunscreen will not work. Most sunscreens have artificial chemicals and colors that can easily flare up eczema and can spell trouble for both the baby and you. What you need is a specially formulated sunscreen that is mild enough to not irritate the delicate skin of your child and yet protect the skin from UV rays. In my experience, the sunscreens that work the best for babies with eczema are formulated with natural ingredients. Staying away from artificial ingredients and preservatives goes a long way in avoiding flare ups. Although there are a ton of so-called mild sunscreens on the market that are marketed to be safe for use in children with eczema, not all of them are good. Some of the ‘mild’ sunscreens are safe, but they don’t offer much protection against the sun. That said, some products are head and shoulders above the competition and provide the best protection using only natural, non-irritant ingredients. In this article, I am going to talk about the best sunscreens that you can buy for your baby who has eczema. After spending hours researching for the best sunscreens I have compiled a list of the top 5 mild sunscreens that offer the best protection. What are the different type of sunscreens? What to look for in sunscreens for babies with eczema? The CeraVe sunscreen is, hands down, the best sunscreen for babies with eczema. It is one of the very few sunscreens that gets all the things right. It is hypoallergenic, chemical-free and fragrance-free as well. The sunscreen is so safe for babies with eczema that the National Eczema Association (NEA) endorses it! That says it all, doesn’t it? The sunscreen is mineral based and offers an SPF value of 45 for an extended protection from both UVA and UVB rays of the sun. Some other natural ingredients such as Niacinamide and Ceramides make it one of the most soothing formulations around. These ingredients in the formula can prevent eczema breakouts as well as control inflammation and swelling. The formula is water resistant for up to 80 minutes and leaves no oily or pasty residue whatsoever. It is also an incredibly easy product to apply as well. It comes in a convenient pump bottle that makes applying sunscreen a hassle-free job! I would strongly recommend trying this sunscreen out. Trust me, once you try this one out, you wouldn’t want to use anything else! The Badger baby sunscreen cream is one of the very few sunscreens that are completely biodegradable. It is a great product that is ideal for sensitive skin. One of the best things about this product is that it makes use of only USDA certified natural ingredients. Some of the ingredients in the formula include Vitamin E, sunflower oil and bees wax. The formula with all these natural ingredients make it perfect for babies with eczema. The product has a mild and soothing fragrance that is derived from natural Calendula and Chamomile extracts. The consistency of the product is also quite good. It spreads easily on the skin and does not leave a pasty residue. If you are planning on going to the beach, the Badger Baby Sunscreen has you covered as well. With a proprietary water resistant formula, the sunscreen can provide UV protection for 45 minutes. I really loved this formula, and it is so good that I sometimes apply it myself as well! The Sunology sunscreen is one of the best mineral based sunscreens for babies with eczema. The fragrance-free formula is gentle and safe and does not irritate the skin at all. One of the things that make this product ideal for kids with eczema is the fact that it is free of all chemicals that are known to cause flare ups including Avobenzone, parabens and PABA. As a matter of fact, the sunscreen is so gentle that it won’t irritate skin or even eyes of your little cherub. The Sunology sunscreen blocks both UVA as well as UVB rays from the sun. It is water and sweat resistant as well. The company claims that the sunscreen can resist water for up to 80 minutes which is an incredible thing. Although in my personal experience, the sunscreen lasts for about 45-50 minutes. But still, it is an impressive feat nonetheless. Another thing that puts this product above the competition is the fact that it contains Moringa oil, that is know for its soothing effect on sensitive skin. Overall, I was very satisfied with the product. It offers great protection and is perfect for sensitive skin. I would highly recommend this product for kids with eczema or sensitive skin. Aveeno is one of the most well recognized brands as far as baby skincare products are concerned. I have always loved their products, and had high hopes from their sunscreen lotion as well. Well, long story short, the Baby Natural Protection sunscreen lotion did not disappoint me at all. It is a very well formulated lotion that is light, non-greasy and most importantly, free from skin irritant chemicals. The pediatrician recommended product contains all-natural ingredients including Titanium dioxide and Zinc oxide. There are no parabens or other harsh preservatives that can potentially harm the delicate skin of your baby. The Aveeno sunscreen has a perfect consistency as well. It is not too runny or too pasty. One other thing that I love about this products is that it is sweat and water resistant. With a SPF factor of 50, it offers protection for a long time and as it is a broad spectrum sunscreen, your kid will be safe from both UVA and UVB rays. If you are looking for a good sunscreen that is sourced from all-natural ingredients, I would strongly recommend you check this one out. TruKid is a brand that is associated with some of the best dermatological products for babies. The Sunny Days Daily sunscreen lives up to the expectations that you have with a TruKid product. It is, hands down, one of the most gentle sunscreens that I have come across. The best part of the Sunny Days formula is that it is completely free of parabens, phthalates and gluten. The sunscreen has both titanium and zinc oxide for the most efficient protection. Another thing that I like about this sunscreen is the fact that it is fortified with Vitamin A, which protects the skin of your young cherub from oxidative damage. The product has a good consistency and is very easy to spread. It forms a satisfying layer on the skin that is not too occlusive, but gets the job done. Overall, it is a fantastic product and I endorse it fully. Depending on the principle ingredients present in the sunscreen, they can be broadly categorized into the following two types. The chemical sunscreens contain special chemicals that get absorbed into the top layer of the skin and neutralize the UV rays of the sun. These sunscreens contain ingredients such as Oxobenzone and Avobenzone that absorb the UV rays of the sun before they can cause any harmful effects to the skin cells. The Mineral sunscreens, on the other hand work on the principle of ‘occlusion’. Ingredients such as Titanium dioxide and Zinc oxide present in these sunscreens act as physical barriers for the UV rays. These sunscreens form a thin layer on the surface of the skin and don’t typically get absorbed in the deeper layers of the skin. As you can imagine, the best sunscreens for babies with eczema are the Mineral type. As these sunscreens don’t get absorbed in the skin, they have the least potential to irritate your baby’s skin. Another thing that works in favor of the mineral sunscreens is the fact that they reflect most of the sun rays. As a result, they don’t generate heat within the skin. On the contrary, the chemical sunscreens absorb the UV rays and generate heat. The heat can further irritate the skin and flare up eczema. So, the mineral sunscreens are the obvious choice for babies with eczema. It can be a bit tricky to pick a sunscreen for your baby even though you understand the basics of the chemical and mineral sunscreens. 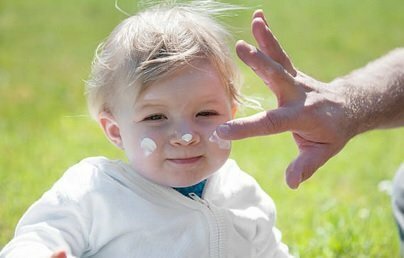 Here are some of the most important factors that you should consider while picking a sunscreen for your baby with eczema. In light of what we discussed in the previous section, it is quite obvious that you should avoid chemical sunscreens at all cost. Mineral sunscreens, on the other hand are best for reducing the chances of flare ups. Minerals such as natural clays, titanium and zinc oxides are safe and usually don’t cause any adverse reactions. A mineral based sunscreen is not automatically a chemical-free sunscreen. Although it may not contain chemicals such as Avobenzene or Oxobenzone, there are other chemicals to worry about as well. Some of the most common chemicals tat can hide behind the minerals include preservatives, colorants and fragrances. Make sure that you are picking sunscreens that contain as few chemicals as possible. There are some great options that contain only natural ingredients and no preservatives. These may be a bit difficult to find. The effectiveness of a sunscreen is measured in a unit called SPF. The higher the SPF value, the better is the protecting ability of a particular sunscreen. Sunscreens for babies with eczema are available in a wide range of SPFs. However, I would recommend to stick with sunscreens with SPF values of 30 or higher. If the SPF value is too low, the sunscreen will fail to do its job and your baby will be left unprotected. As I alluded to before, there are two types of UV rays coming from the sun- the UVA and the UVB. While both of them are harmful, they differ in intensity of the damage the cause to the skin cells. A good sunscreen should protect your baby’s skin from both these types of UV rays. Make sure that you are selecting a sunscreen that is broad spectrum, i.e can block both UVA and UVB rays. The consistency of the the sunscreen is also an important factor to consider. If the sunscreen is too watery, it will not be able to form a uniform coating on the skin and hence will not provide an optimum protection. Make sure that you are picking a sunscreen that is not too thin and not too thick at the same time. Many sunscreens contain ethyl alcohol or isopropyl alcohol in the formulation. These alcohols help the sunscreen to evaporate faster, but they can irritate the skin and flare up the eczema. Make sure that you are picking a sunscreen that is a 100% alcohol-free if you want to avoid any skin irritation. Apply an emollient (moisturizer) at least half an hour before applying a mineral based sunscreen. Mineral based sunscreens are known to dry out the skin and applying a moisturizer prior to applying a sunscreen can help prevent drying out of you baby’s skin. Make sure that you are not picking a sunscreen that is too thick and greasy. It is always better to go for a lighter and creamier consistency. Make sure that you are not using any perfumed sunscreens. If there is a fragrance to the sunscreen, make sure that the fragrance comes from a natural source. If you are trying out a particular brand of sunscreen for the first time, make sure that you test it out on a small portion of the skin before going full on. The best place to test a new formulation is behind the ear or on the forearm. Make sure you dress your kids in lose and light colored clothing. Also, avoid going out in the sun during the peak hours, i.e late morning to late afternoon. 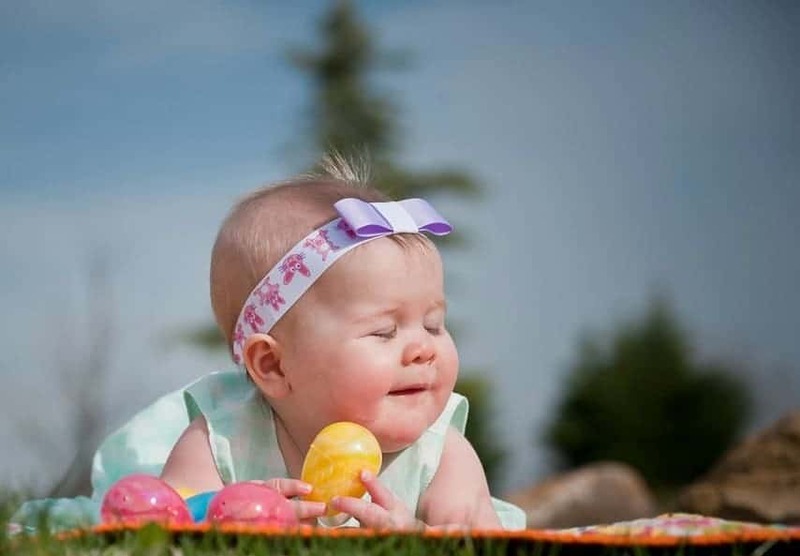 After reviewing some of the best sunscreens on the market for babies with eczema, the one sunscreen that stands out is the Baby﻿﻿ Sunscreen by CeraVe Baby. It is one of the gentlest sunscreens on the market. It offers excellent protection, is fragrance-free and is even endorsed by the NEA! If you are looking for a sunscreen for your baby with eczema, the CeraVe baby is the best option you can buy right now. If you found the information in this article helpful, please share it with your family and friends. 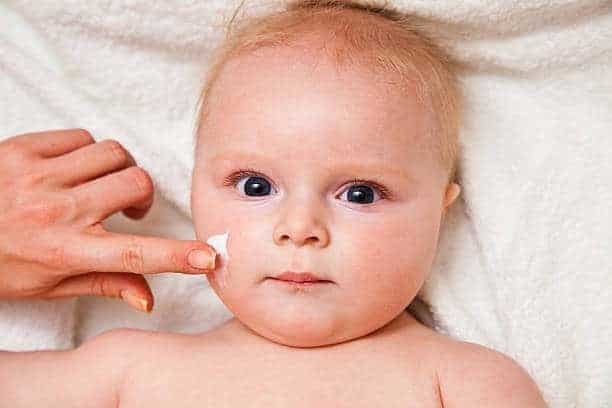 Mayoclinic: When is it OK for a baby to wear sunscreen?